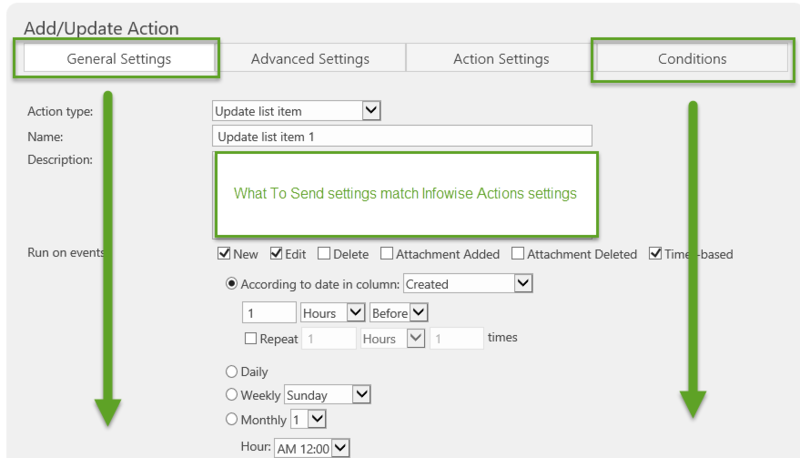 The What To Send configuration section matches the same functionality as the Smart Actions settings. The same concepts and rules apply. Email alerts can be thought of in the same way as Smart Actions because rules are configured using the same functionality. The same concepts apply in each section. First determine whether the rule and related conditions should be considered for Add, Modify and Delete. Additionally you can add a trigger for the rule to happen based on a date configuration. For example, the rule can be cofigured to run repeatedly on a schedule. The rule will always be run on a new record. The rule will always be run when a record is edited. Based on the condition the rule will not ever run when the Due Date is less than or equal to the current date held in the Today variable. Using a pattern like this, it is possible to configure a nag email that prompt users to take action with stalled records. When setting conditions, be sure to understand the AND / OR operators as described in the Actions section. 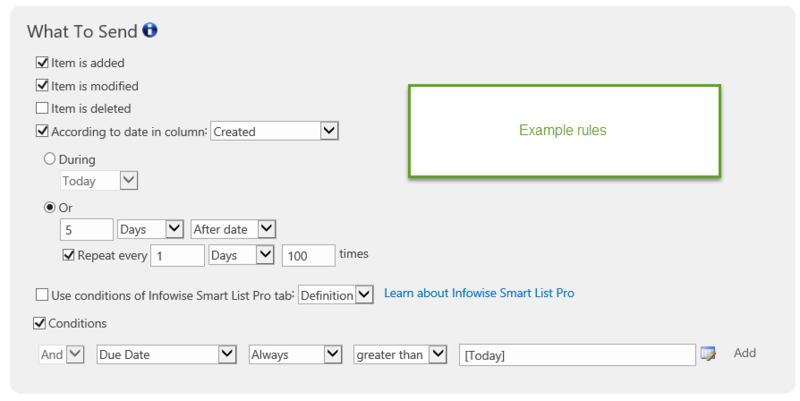 What to Send rules closely match the functionality defined in Smart Actions. The conditions can help to restrict when alerts are triggered and ensure that email alerts are only sent based on specific conditions. Nag Emails are useful to set up when reminders need to be send out periodically especially for stalled requests.